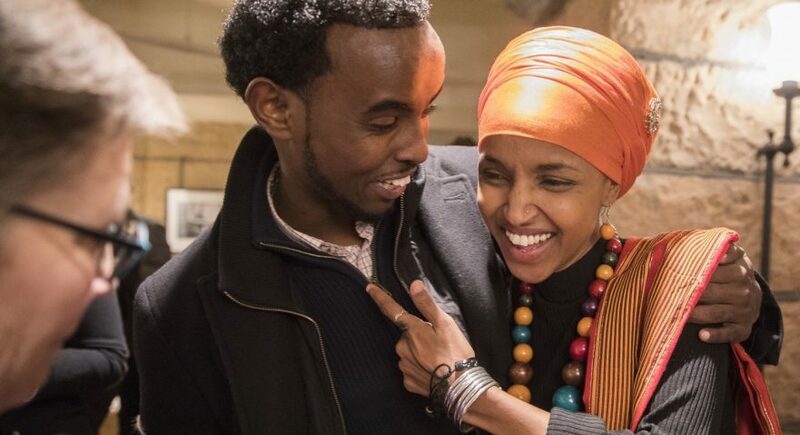 The recent fury and attacks on Ilhan Omar and her forthright statements exposing and criticizing the role of the Israel lobby and the Congressional requirement of allegiance to the policies of the state of Israel come at time when issues of political framing are roiling Jewish and progressive communities. It is becoming increasingly clear at this political moment that there are major generational divisions within the Democratic Party and within the general population. More people are also willing to say out loud that antisemitism is very different from critical thinking about the continued rightward plunge of Israeli politics. For me this further clarifies my understanding that working on Israel/Palestine and doing Palestine solidarity work is most effectively accomplished within an anti-racist, anti-white supremacist framework. So how did that strategic awareness happen for me? I came from a traditional Jewish family where our love of Israel was as uncomplicated as lighting candles on Shabbat or our pride in our roots in the tenements and sweat shops of the Lower East Side of New York. It wasn’t until the 1990s that I began to face the contradictions between my adult political self, working on issues of women’s rights, civil rights, health care justice, and my growing discomfort with Israel. At first I understood that this debate was really only of interest to Jews and Palestinians, although I quickly expanded that to some of the progressive Christian community. For us, the problem started in 1967 and our work was ending the occupation and supporting the radical notion of a two-state solution. As I listened to Palestinians sharing their stories and read the works of Israeli historians who were delving into state archives and history that had been largely disappeared from Western consciousness, I began to understand that the problem actually began in 1948. This is what has been called Israel’s original sin, the founding of Israel as a Jewish state in historic Palestine on the backs of an indigenous population who were killed, expelled, exiled, and disenfranchised. I was forced to give up my understanding of Israel as purely and justly a safe refuge post-Holocaust, with socialist roots and kibbutzim, “the light unto the nations.” I began to see Israel as an important U.S. ally that was becoming increasingly part of U.S. foreign policy: a foot in the door for oil resources and for challenging Soviet influence in the Arab world. Post 9/11 Israel became our trusted partner in the fight against “terror” or “Saddam” or “Iran”, or whatever Washington’s enemy of the month might be. The country also became a major player in our arms and security industries. Supporting Israeli policy uncritically became increasingly problematic for anyone with a progressive identity. What this meant for me was that “the problem” really began with Zionism. I began to see Zionism which I had thought of as a Jewish liberation movement, our brand of nationalism, as an inherently racist national movement. I became aware that a movement that privileges Jews (in particular, white European/eastern European Jews) is most accurately understood as a settler-colonial project more like South Africa and the U.S. This was a huge struggle on the Jewish left, especially after the Durban Conference Against Racism in 2001. Is Zionism inherently racist? How could this be? Not us. Gradually I came to understand that we Jews had used our victimhood to get a pass on Zionism. This was very unsettling. As years passed, the continued rightward swing of Israeli leadership and the population at large, the obvious cultural, political, and institutional racism of Jewish Israelis towards Jews of color as well as Palestinians and African asylum seekers, further exposed the inherent racism and white supremacy that is the foundation of the Zionist movement as it is currently practiced. My vision expanded further starting in 2005 with the launching of the Boycott, Divestment, Sanction campaign. For me, linking tactics in the Palestine struggle with strategies used by Quakers against slavery or in the fight against South African apartheid opened my eyes to a broader concept of the work. This was followed by the growing support of African American leaders and the position of Black Lives Matter, clearly linking anti-racist struggles in the U.S. with Palestine solidarity. Palestinian activists advising black activists in Ferguson on how to deal with tear gas meant that the feeling was mutual. And the framing broadened further. I saw shared struggles against militarism and police brutality and systems of mass incarceration and the building of walls. This was no longer an issue for Jews and Palestinians alone. I have also witnessed, particularly since 1967, the rise of the power of the Israel lobby, primarily evangelical Christian Zionists and AIPAC, as well as a host of prominent, well-funded think tanks like the Washington Institute for Near East Policy (WINEP) and the multimillion dollar Israeli hasbara industry. Added to that was the growth of Israeli surveillance of internationals and the use of ex-Mossad spooks to keep track of and subvert the work of anyone raising significant questions. I was forced us to ask: who are the folks who are blindly in support of Israeli policies? Are they folks that progressives feel comfortable working with? Why not? It became uncomfortably clear to me that racism, Islamophobia, and Jewish exceptionalism were at the core of all of their positions. In the past few decades, various “peace plans” have come and gone, the Oslo Accords, the work of the Quartet (United States, the United Nations, the EU, and Russia), the Geneva Accords, etc. All have been weighed down by profound inconsistencies and U.S. dominance. At the same time, the movement for Palestinian nationalism which was focused on building a Palestinian state, has grown and matured into a movement for self-determination, human rights, and respect for international law. Clearly, we as Palestine solidarity activists need to listen to what Palestinians are asking of us, rather than in telling them what to do. The days of a U.S. dominated peace process, all process and no peace, are over (note to Jared Kushner). Thus it is clear to me that an anti-racist, anti-white supremacist, anti-global military-security- industrial complex should be the foundational litmus test for our work. Some are worried that an intersectional approach will dilute out the Palestinian struggle, that interest and energy will be lost. I would argue that such a framing actually creates more supporters and is consistent with the kind of work the younger generations are engaged in. This also moves us away from exceptionalizing the struggle for Palestinian rights and focuses us on the contradictions and injustices in the U.S. as well, a country that extolled manifest destiny and was founded as a settler-colonial state that committed genocide against indigenous people. We must continue to deal with the legacy of racism, marked disparities in education, opportunity, water, legal justice, etc. Doing this, we place ourselves within a global progressive movement for justice, for respect for international law, for indigenous rights, immigrant, gender, water rights, climate justice, and free speech. It is no longer acceptable to be “Progressive Except Palestine” but it is equally unacceptable to be “Progressive Only On Palestine.” This was clarified for me with the work of Muslim leaders like Linda Sarsour and Ilhan Omar who clearly stand against the reactionary policies of the Israeli state that are funded and blessed by the U.S. and for Palestinian rights, as well as against racism of all kinds and for progressive struggles for equality and justice. This framing defuses the accusation that criticizing Israel is inherently antisemitic. This struggle is not about Israel as a Jewish state, but about how Israel behaves as a state in the community of nations.